But I have an idea. If these guys are so impressed with themselves, and if they are so sure of their correctness, why doesn’t President Obama come on my show? We will do a one-on-one debate of ideas and policies. Now, his people in this Politico story, it’s on the record. They’re claiming they wanted me all along. They wanted me to be the focus of attention. So let’s have the debate! I am offering President Obama to come on this program — without staffers, without a teleprompter, without note cards — to debate me on the issues. Barack Obama obviously isn’t going to agree to debate Limbaugh, on Rush’s show or anywhere else. So Rush will keep taunting Obama and he’ll claim that the President is afraid to face him. The Dittoheads will eat it up with a spoon. The kid has AM detention (don’t ask), so I have to make this short. Quick question: What do the following American taxpayers have in common? Answer: They all agreed to defer part of their employment compensation package for future retirement benefits in the form of healthcare, 401K savings and pensions and they are the ones who are seeing massive failures in all three future compensation mechanisms. We’ve heard a lot about how Americans don’t save enough and I think we all know people who spend money like there’s no tomorrow. But what about the vast majority who *did* save for tomorrow by buying into the notion that the company or state or financial services provider was carefully stashing away money on our behalf? 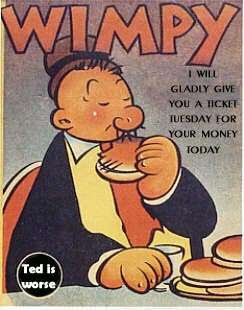 We gave them our trust and our money and many of us, including yours truly, are paupers today. I’ve just seen 12 years of savings wiped out in the blink of an eye. The finance industry has a pretty sweet deal. They had access to our savings for years now and they gambled it all away. For the stupid wage slave out there (and let’s face it, that’s how they see us), there’s very little left from the promise of future rewards if we just defer our savings. This is the result of deregulation. We gave them our money in good faith and there was no accoutability for what happened to it. It was like giving your life savings to a gambling addict with no requirement that the money had to be returned, in full with interest, by the end of the night. No penalties for failing to do so. We were *encouraged* to do this. My employer signed me up for the 401K plan the first day I started to work. For the banking industry, the insurance companies, the shareholders, it’s all NOW, NOW, NOW! For the rest of us, “take and old, cold tater and wait” and oh, by the way, all your taxes are belong to us. They never meant to keep their promises and no one was going to make them. This is the price we paid for deferral. Recommendation: Simon Johnson of Baseline Scenario did an interview with Terry Gross recently on Fresh Air. He says the banking industry is very powerful and says what we’ve all been thinking: they bought Obama and he can’t say “No” to them.